At about 07:00 local time Ibrahim El -Bakraoui and Najim Laachraoui blew themselves up near the ‘American Airways’ counter causing the death of 14 people and the wounds of dozens more. One of the three left behind a suitcase bomb that exploded about the same time. Faycal Cheffou fled the Zaventem area leaving behind his suicide explosive west after he failed to detonate it. An hou r later, at about 08:00 Khalid El-Bakraou, 28, the younger brother of Ibrahim El -Bakraoui, blew himself up in Brussels’ metro Between Maelbeek & Schuman stations. 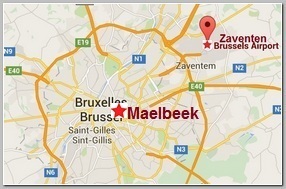 20 people were killed in Maelbeek explosion and about 100 wounded. Altogether 34 were killed and almost 200 were injured. The blasts occurred just 4 days after the capture in Brussels of Salah Abdesalam, the main suspect in the Paris attacks of 11/13/2015. Suggesting a premature attack, by the same infrastructure in fear that Salah Abdeslam may talk to much during his interrogation by the Belgian authorities . The first finding of the investigation was, indeed, that the explosives were Triacetone Triperoxide – TATP, a homemade explosive identical to the material used in the Paris Carnage on 11/13/2015 . The two El-Bakrawi brothers, Khalid (L) & Ibrahim (R) are known for gangster-related crimes and not Islamic radicalization but they fled, on Tuesday 03/15/2016, the scene of the Belgian anti-terror operation in the southern suburb of Forest, close to Molenbeek. RTBF Belgian news channel said Khalid was jailed in 2011 for carjacking while Ibrahim, 30, was jailed in 10/2010 for firing at police. Turkey’s President Tayyip Erdogan has said, on Wednesday 03/23/2016 evening, one of the Brussels attackers, referring to Ibrahim El -Bakraoui, had been caught in Turkey, in 07/2015, and deported to the Netherlands and also notified the Belgian authorities, adding that they “ignored” Turkey’s warning . He was nabbed in the Turkish town of Gaziantep, a known passage for Jihadists to join I.S.I.S in Syria but the Belgian authorities released him on the ground that there are not enough evidences he wanted to join terror . Few hours after the attacks on Tuesday. a taxi driver who drove the suicide bombers to the airport led the police to the apartment in a residential building in the impoverished south side of Schaerbeek . In the apartment police found a suitcase bomb filled with screws and nails, 15 k”g of explosives, detonators for suicide belt, identical to those used in Paris on 11/13/2015, 150 litres of acetone, 30 litres of oxygenated water and a black Islamic State flag and the fingerprints of Najim Laachraoui, the bomb’s engineer of both Paris and Brussels attacks . Police also found Ibrahim El Bakraoui had left a video will on a computer that was found. According to the obtained Bakraoui’s will, he was “in a rush”, “didn’t know what to do, hunted everywhere, no longer safe” and he “didn’t want to end up in a cell”, Frederic van Leeuw, The Belgian Prosecutor said at a press conference on Wednesday 03/23/2016 afternoon.
. Local media reported that the driver had refused to take one of men’s large bags, apparently the nails bomb, because there wasn’t enough room in the vehicle . The trio actually ordered a large taxi for three persons and five pieces of luggage. When the taxi arrived, which turned out to be too small for the luggage. The three men were upset. .
Belgian prosecutors have said, on Thursday 03/24/2016 morning, at least four people were involved in Brussels’ attack and another suspected of taking part in the bombing in Brussels subway train. 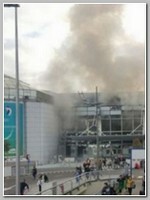 Although caught on CCTV at Metro station it was unclear whether the man had died or escaped before the blast. According to a list circulated to the security services of other European countries after Tuesday’s attacks the Belgian authorities refer to Mohamed Abrini, a close associate of Salah Abdesalalm and one of the Paris attacks of 11/2015 organisers, as a prime wanted suspect on the run along with Najim Laachraoui. They also named a new suspect as Naim al-Hamed, 28. The Belgian police also arrested 6 suspects in Schaerbeek neighborhood on Thursday 03/24/2016 night, followed house-to-house searches. One of those detainees was Abderahmane Ameroud . He was detained after being shot in the legs at a tram stop in Brussels. Abderahmane Ameroud was convicted and sentenced to 7 years in jail as an accomplice, in Belgium, to the assassination of Ahmad Shah Massoud, by two members of Belgian Al-Qaeda cell, on 09/09/2011, two days before The 9/11 . Two other suspects were named as Rabah N & A Abubakar. Both had been placed under arrest and charged with participation in the activities of a terrorist group. Me anwhile, Belgian police arrested 3 more people on Friday 03/25/2016. Belgian media have identified him as Faycal Cheffou (pic-L) , who was detained with two others near the Prosecutor’s office, was carrying a bag of explosive materials. He was charged, on Saturday 03/28/2016,with terror offences .after being identified by the taxi driver who drove the three would be suicide bombers from Schaerbeek neighborhood of Brussels to Zaventem Airport as the third passenger in his car . Faycal Cheffou, after acharged in Belgium with terrorist offences and murders in the Brussels attacks, has been released for lack of evidence on Monday 03/28/2016. In a statement released through one of its propaganda outlets, the so-called Islamic State said “explosive belts and devices” were used to massacre passengers checking in at Brussels Airport and on a Metro train. “Islamic State fighters opened fire inside Zaventem Airport, before several of them detonated their explosive belts, as a martyrdom bomber detonated his explosive belt in the Maalbeek Metro station,” a spokesperson said. “We promise the crusader alliance against the Islamic State that they will have black days in return for their aggression against the Islamic State,” the jihadist group said. ** The Brussels suicides attack, on Tuesday 03/22/2016, and the findings afterward suggest Salah Abdesalam so called ‘cooperated’ with his interrogation and giving away some useful information related to the past were in order to deceive his interrogators about the much more important information about the plans for the near future – the attacks in Brussels . ** After distributing a video footage of ”the man with the hat’. the third repent suicide bomber in Zaventem Airport. the Belgian police identified him as the Paris attacks fugitive Mohamed Abrini and managed to arrest him along with Osama Krayem , on 04/08/2016. He admitted the next day in his initial interrogation to be. Indeed, the third attackers who fled the scene leaving behind his suicide belt .